The 8th annual Savor Dallas, a celebration of wine, food, spirits and the arts, returns March 30 and 31. The popular Arts District Wine Stroll gets the event underway on Friday, March 30 from 5pm to 7pm , where attendees are invited to "drink-in the arts" at four beautiful locations in America's largest contiguous urban arts district. Friday activities continue with a new wine, food and music event, "Sips and Sounds" at the historic Kessler Theater in Dallas' Bishop Arts District. This wine, beer, spirits, and food sampling - featuring some hot chefs from Bishop Arts - is followed by a concert from Texas music sensation Carrie Rodriguez. The International Grand Tasting takes place on Saturday, March 31, from 7pm to 10pm, at the Irving Convention Center at Las Colinas. 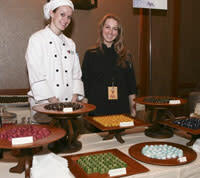 The events features cuisine from over 60 of the area&apos;s top chefs and more than 400 premium wines, spirits and imported beers.Connoisseurs will want to attend the limited attendance Reserve Tasting preceding the International Grand Tasting, to sample the finest wines and spirits available. Other events include wine and cheese tasting seminars at the Rosewood Mansion on Turtle Creek and the Four Seasons Resort at Las Colinas, and "Wine, Women, and Lunch," featuring top female chefs and winemakers. or call 888-728-6747. Individual tickets are available for all events. The Savor Dallas Getaway Weekend! The Savor Dallas Getaway Weekend includes a room at the Four Seasons Resort at Las Colinas for the weekend, round-trip airfare for two to DFW, a rental car for the weekend, tickets to Savor Dallas events, and to several arts attractions in Dallas-Fort Worth. Congratulations to Nathan Mallon of Nashville, TN, the winner of the getaway weekend! Click HERE to see special rates and packages for Savor Dallas 2012. Irving Convention Center at Las Colinas, 500 W. Las Colinas Blvd., Irving, Texas 75039. Featuring more than 60 of Dallas-Fort Worth&apos;s top chefs serving samples of their cuisine and more than 400 premium wines, spirits and imported beers. Click here to learn more about the International Grand Tasting, including participants, chefs, profiled beverages, and more.